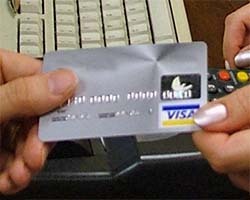 0% Interest Credit Cards on Purchases. If you are looking to spread the cost of a big purchase the credit cards we compare could bring huge savings in interest. The best credit cards offering interest free purchases are those which offer the longest interest free period, providing you are confident that the debt can be totally cleared before interest is charged. As credit card interest rates are high, such cards are often a poor way to fund any continuing debt, so this should be avoided if at all possible. Credit cards offering interest free purchases can be particularly effective for spreading the cost of car insurance as car insurance companies often charge well over the odds if you want to pay by instalments and it's usually the higher premiums that get the worst rates. Just make sure you plan to repay the cost of the insurance within a year! Now that credit cards are repaid with the highest interest balances being repaid first, credit cards offering purchases to be borrowed for interest free are more attractive than ever, although the current credit environment means that the credit scoring for any card with an interest free promotion tends to be as tight as ever. Consider running a credit card check using a service such as Credit Expert - which is subject to a monthly fee, but allows a 30 day trial period first during which a credit check can be run free of charge.